And Speaking of Runners: It's An ANR Sweep At The Moosalamoo Trail Run! The Department of Environmental Conservation recently released a new strategic plan identifying twenty-one goals to work towards achieving over the next two years. Our spirit of resilience is a key theme in the strategic plan, as it reflects our efforts to ensure that our Department and the state benefit from the lessons and challenges of the past few years. Whether drawing upon the power of our natural systems and working landscapes to protect and sustain Vermont communities, or tapping our own potential to find new and innovative ways to serve Vermonters, we are committed to building our Department, in ways that are better and more effective than ever. You can read the new DEC strategic plan here. The Vermont Endangered Species Committee is an appointed board comprised of representatives of state government, non-profits, and universities in Vermont. The board advises the Secretary of the Agency of Natural Resources on state threatened and endangered species listings and conservation measures. ANR Secretary Deb Markowitz recently recognized Board Chair Sally Laughlin and long-standing member Ian Worley, who stepped down at the end of July after an impressive 30 years of service. According to Laughlin, "The key to the success of the Endangered Species Committee is that all of Vermont's top scientists in their field lend not only their expertise, but also their commitment and passion." Recently, a wonderful tribute to Laughlin was published in a local publication. To read more about Sally Laughlin and her long and impressive career, have a look here. It is clear that both Laughlin and Worley shared their expertise, commitment and passion, for many many years, with all of us. Thank you, sincerely, to both of you for the years of dedication, commitment and service. Congratulations on your retirement! I recently wrote an op-ed to commemorate the two-year anniversary of Tropical Storm Irene, and to share some of the various ways that we at the Agency of Natural Resources (ANR) have worked to address the contributing factors that led to the extreme flooding that Vermont experienced as a result of the storm. Although we can and will do whatever we are able to ensure the current and future resilience of our communities, flood resilience and so many of the other issues that we face are complex. There are no easy fixes, and most of the efforts that we undertake require significant and sustained collaboration with the public. Luckily, history has shown time and again that Vermonters understand the value of their contributions and sincerely want to do the right thing. One of the greatest challenges when facing so many complicated and inter-related issues is that it is sometimes difficult to know just what "the right thing" entails. It is in just this type of situation that the dedicated staff at the ANR are well-positioned to help. Our staff are the experts, not only in the healthy functioning of natural communities, but in addressing the intersections between people and nature. One of our primary roles is to provide members of the public with access to science-based expertise and information that can help, not only to explain the "why's," but to provide a roadmap that helps with the "how's" as well. One of the ways that we meet this charge is by developing and distributing a wide variety of publications like this one. Throughout the year, the ANR and each of its departments' staffs create a diversity of publications, with topics that provide information and technical expertise to many audiences. We utilize a selection of delivery models, tailored to the readers' needs and access to technology. The summer edition of Ripples is dedicated to highlighting a sampling of the many publications that we produce. While not an exhaustive or complete list, we hope as you read through these stories you will be impressed by the depth and breadth of topics covered. Each article below was recently featured in an ANR publication, and each contains information about the original edition, as well as how to subscribe if you would like to do so. Topics span the gamut, from energy to water quality to recreational opportunities. What all of our publications share, however, is a common goal: to partner with Vermont residents, businesses, communities and visitors, and to provide them with access to information that lays out a roadmap for living, working and playing in ways that are healthy and sustainable today, and in the long-term. Resilience is the ANR's report on the state of Vermont's environment. Vermont lakes are natural jewels left by glaciers that melted away over 10,000 years ago. Some have a rich history that includes battles, settlement by native Americans, and the transport of traded goods. Now our lakes provide fishing, boating and other recreational opportunities, as well as shores for homes, camps and beaches. Ecologically healthy lakes are essential to Vermont's prosperity. A new assessment of Vermont lakes builds on the results of more than 30 years of lake monitoring by Agency of Natural Resources (ANR) staff and volunteers across our state. This assessment delivers some surprises about the condition of our lakes. Water quality problems - such as phosphorous pollution - are a major concern for a few lakes, including Lake Champlain. The biggest threat to the long-term resilience of most lakes, though, is the increasing degradation of shoreland habitat. What Can We Do To Conserve The Remaining Natural Vegetation Along Our Lakeshores? Beginning in 2007, Vermont and many other states joined with the U.S. Environmental Protection (EPA) to complete a rigorous scientific assessment of the nation's lakes. 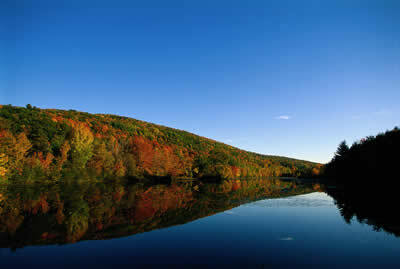 Fifty Vermont lakes were randomly selected for the assessment. Choosing a random sample ensured that the results could be used to draw sound conclusions about the health of all Vermont lakes, large and small. The greatest threat to lake health, according to the assessment, is the lack of physical habitat complexity along lakeshores - both on land and in shallow water. Sixteen percent of Vermont lakes greater than 25 acres in size have "poor" habitat complexity (Figure 1). Read more. The Climate Connection is a quarterly ANR newsletter covering a wide variety of climate change issues related to Vermont. Efforts to construct a corridor of electric vehicle charging stations between Vermont and Montreal have been gaining momentum recently. First discussed last summer, commitment to the project was reaffirmed in February at a meeting between Governor Shumlin and the new Quebec Premier, Pauline Marois. Vermont has identified sites for charging stations in seven different communities along the I-89 corridor: St. Albans, Burlington, South Burlington, Waterbury, Montpelier, Sharon and Norwich. Stations are in place in Sharon, Montpelier, South Burlington and the newest location in Waterbury. The rest of the charging stations remain in various stages of development. The stations along the corridor will provide "level two" charging capacity. This translates to approximately 10-20 miles of added driving range for each hour of charge. This is a significant improvement over standard "level one" charging stations, which provide only 2-5 miles of added range per hour of charging. The project aims for the sites to be easily upgradeable to even faster charging infrastructure as demand for the service continues to grow. The much more expensive "level three" chargers can provide 60-80 miles of range in just 20 minutes of charging. As of April 1 there were a total of 308 plug-in electric vehicles registered in Vermont. Read more. The Vermont State Parks maintains a blog that features stories, photos, events, tips and tricks related to Vermont state parks and the many activities they offer. Niquette Bay State Park in Colchester, at the north end of Mallet's Bay, offers six and a half miles of wooded hiking trails with sweeping vistas in close proximity to the Burlington metro area. The trails are designed in a series of three interlocking loops, all of which bring you to a different place on almost a mile of Lake Champlain shoreline. A popular park with local area walkers and hikers, the trails are as yet an undiscovered gem for trail runners. As the park ranger here at Niquette Bay, I have the opportunity to meet lots of interesting people. This spring, one of our regular park visitors mentioned to me that he had just participated in a 100-mile long trail run, and that it was his training and running regularly here on the trails in the park that made it all possible. I'd like to introduce you to David Delibac. Dave is an ultra-marathon trail runner. What is that, you may ask? An ultra-marathon is an event longer than the traditional marathon length of 26.2 miles. And, trail running is a sport which consists of running and hiking over trails instead of roads. Usually the course takes place on hiking rails, often in mountainous terrain and with extreme course obstacles such as inclement weather, elevation changes, and rugged terrain. Combine all these elements, and you have an ultra-race. After years of running road marathons, Dave attempted his first ultra-race when he turned fifty. Read more. Natural Heritage Harmonies is a publication of the Wildlife Diversity Program of the Vermont Fish & Wildlife Department. Click here to subscribe. Fifth and sixth grade students at the Waitsfield Elementary School raised $700 for the Vermont Fish & Wildlife Department's Nongame Wildlife Fund to support research and conservation of Vermont's bat populations. The students were inspired to raise money for bats after wildlife technician Alyssa Bennett gave a presentation last spring on the massive die offs that threaten several of Vermont's bat species with localized extinction. The Die offs have occurred during the last five years due to white-nose syndrome, a fungus that has affected bat colonies in the Northeast. After learning about the threats facing Vermont's bats, the students were inspired to embark on a service learning project to help save them. The students built four-chambered bat boxes and sold them to raise money to donate to the Nongame Wildlife Fund. They also filmed public service announcements for their local TV station, composed a brochure on bat conservation, and created a children's book on bats for their school library. "The beauty of this project was the organic development of student-generated projects that directly supported habitat restoration for bats in Vermont," said Waitsfield Elementary teacher Lee Van Dine. "This project engaged students, staff and community members to raise awareness and support." Bats generate an estimated $3.7 billion a year in benefits to North American agriculture through insect pest control and crop pollination, according to the journal Science. Vermont is home to nine bat species. White-nose syndrome has caused a 90 percent decline in Vermont's two formerly most common bat species, the little brown bat and the northern long-eared bat, and it threatens fragile populations of the small-footed bat and Indiana bat. According to Bennett, Vermont has been a leader in bat conservation since white-nosed syndrome began to devastate the bat population. Our conservation efforts depend on the citizen reporting and community support we receive to be successful. You can find out how to build your own bat box, how to report a bat colony that you've found, and other ways you can help Vermont's bats at www.vtfishandwildlife.com/wildlife_bats.cfm. Waterline is a publication of the Drinking Water Program of the Vermont Department of Environmental Conservation. To subscribe, please contact Ashley Lucht at ashley.lucht@state.vt.us. The EPA has just announced the release of version 1.1 of the Community-Based Water Resiliency (CBWR) Tool. This updated version of the CBWR Tool includes more than 400 tools and resources to enhance a community's resiliency to water service disruptions. A main component of the tool is the self-assessment, which provides users with questions tailored to their stakeholder group and culminates in a self-assessment summary report. The report details the strengths and weaknesses of the users' community's resiliency and recommends tools and resources that can be used to enhance resiliency. Users can then navigate to the CBWR toolbox, where they can find more information about the recommended tools and resources. While the tool was originally created to support "security" needs, the self-assessment and resource lists are also helpful for small communities to better understand how to prioritize their infrastructure and planning needs. The tool is also helpful to community boards and councils who otherwise many not understand what and how to encourage their citizens to plan and prepare for floods, tornadoes, wildfires, and other events that may disrupt their water or other essential services. TREEmail is an email newsletter brought to you by the Vermont Urban and Community Forestry Program, an initiative of the Vermont Department of Forests, Parks and Recreation in partnership with the University of Vermont Extension. Rhonda Mace, Vermont's Forest Pest Outreach and Survey Coordinator, stepped off the bus in Vorheesville, NY and was immediately struck by an adult Emerald Ash Borer (EAB). Few of us have seen a live EAB adult and even fewer have been hit by one; the chances of which I thought were on par with finding a needle in a haystack. But here I was staring at the closest New York EAB infestation and what I witnessed was shocking: crowns thin from branch dieback, trees riddled with S-shaped larval galleries and bark that had been flecked off in strips by hungry woodpeckers. It's one thing to see photos of ash trees killed by EAB on the internet and quite another to have it hit you, literally, in the face. Read more. Category 3: Example of a cyonbacteria bloom that poses a risk to people and animals. Contact should be avoided. Out of the Blue is a publication of the Lakes and Ponds Program of the Vermont Department of Environmental Conservation. To be added to the Out of the Blue mailing list contact Amy Picotte. In cooperation with the Vermont Department of Health (VDOH), the Watershed Management Division has produced a guide for towns to use in recognizing cyanobacteria blooms (toxic algae) and evaluating the risk they pose. The Watershed Management Division and the VDOH have worked toegether for years samping and identifying cyanobacteria blooms in northern Lake Champlain, analyzing samples for the presence of toxins, and issuing detailed weekly health advisories as necessary. However, program expenses were high, and a more efficient method of working with communities on additional lakes was needed. The new guidance first helps community members sort out lake occurrences that are either not algae blooms at all (e.g. pine pollen accumulations in the spring) or are green or other kinds of algae blooms that do not pose a health risk. These occurrences are described as Category 1 or Low Health Risk. Second, if cyanobacteria are present but in low numbers, it is a Category 2 situation, where toxins may be present, but at low concentrations. In this case the situation can be monitored and people and pets should avoid visible scums. Category 3 is a situation where cyanobacteria are present in large numbers and cover an extensive area. In this case, the bloom may pose a risk to people and animals, and contact should be avoided. Since sampling for toxin presence can take a day or two, and the bloom may dissipate or be blown elsewhere, the guidance focuses on the importance of informing people and communities to avoid swimming (for dogs too) or having other water contact until the bloom has entirely died off. To view the guidance, visit: http://healthvermont.gov/enviro/bg_algae/documents/BGA_guide.pdf. Or, contact Angela Shambaugh for questions. The Vermont Furbearer Management Newsletter is a publication of the Vermont Fish & Wildlife Department. To subscribe to this publication, contact Lil Lumbra. It was hard to miss the flurry of press coverage the Canada lynx surveys in the Northeast Kingdom got this past winter, but it is even harder to make sense of what these surveys mean for Vermont. As is typical of things of this nature, the emotional reaction to the news has ranged from downright elation to extreme anxiety. Quite frankly, I'd be remiss if I didn't tell you that I myself have personally experienced the whole emotional array. However, when I step back from the vortex and examine the facts, it doesn't take long for both my elation to be subdued and my anxiety to be calmed. Historical records of Canada lynx in Vermont are few. Although the actual status is not clear from historical records and documentation, it is believed that lynx were found at low densities prior to European contact into Vermont. Only four records of lynx exist in Vermont between 1797 and 1968, which leads one to believe that lynx historically occurred here only sporadically. Since 1998, the Vermont Fish & Wildlife Department has received 26 reports of supposed lynx sightings. Ten of these reports were deemed to be of high quality and resulted in nine actual confirmations based on various criteria and assorted methods of follow-up investigation. Most of the high quality reports and all of the actual confirmations were located in the northeast portion of the state in Caledonia, Essex and Orleans counties. Although only limited inferences can be made from such sightings data, it has been clear for some time now that these animals are moving into the state. What remains unclear, though, is what these animals will do through the future. Read more. ANR trail runners Craig Whipple, Rebecca Phelps, Jay Hollingsworth and Tony Mathis, all racers in the Moosalamoo 14-miler. Rebecca was the first woman finisher of the day, and Craig, Jay and Tony all came in first in their age categories. And Speaking of Running...It's An ANR Sweep At The Moosalamoo Trail Run! Big congratulations are in order for Fish & Wildlife employee Joel Flewelling, who placed first in his age category in the 36-mile Moosalamoo ultra-marathon. weather was great, the scenery even better, and all five of our runners won in their categories! Craig Whipple (FPR), Rebecca Phelps (FPR), Jay Hollingsworth (DEC) and Tony Mathis (DEC) all competed in the half marathon. Rebecca, who came in 5th overall, was the first female finisher. Jay (4th), Tony (13th) and Craig (14th) took first place, respectively, in the 40-49, 50-59 and 60-69 age categories. Congratulations to all four! While our four half-marathoners were recuperating at a post-race barbeque, a fifth contestant was still out on the trail. Fish & Wildlife employee Joel Flewelling, who opted to compete in the 36-mile ultra-marathon race, ran for an amazing 7:26:11. Flewelling placed first among the 30-39 age group, and finished 4th overall in the ultra-marathon category. The 2013 race was the second to be held at Moosalamoo. The race starts and ends at the Blueberry Hill Inn near Middlebury, Vermont. Besides featuring some of the most beautiful trails and scenery in that part of the state, the courses featured mostly single-track, with no paved roads at all. Those readers who are interested can find full race results here.